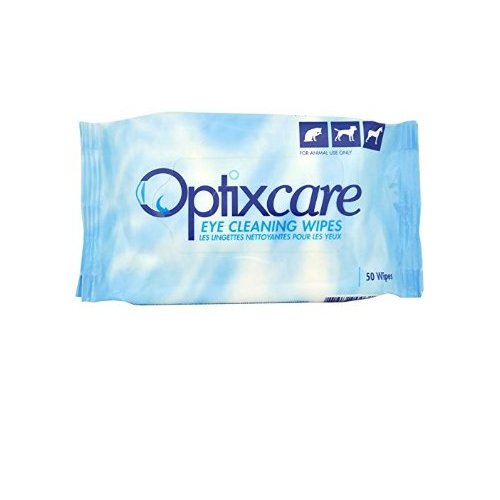 Optixcare Eye Cleaning Wipes are made from lint free, soft cloth which is saturated with Eye Cleaning Solution. This pack of 50 convenient wipes can be used to clear debris or stains from around the eye. Optixcare eye cleaning wipes are only to be used on dogs, cats and horses. Sterile water, PEG 80, polysorbate 80, hyaluron, sodium citrate, disodium EDTA, sodium chloride, sodium perborate, chamomilla recuitita. Optixcare Eye Cleaning Wipes are an ideal tool to help remove light staining and accumulations of debris or secretions from around your pet’s eyes. The wipes are soft and moistened with Optixcare Eye Cleaning Solution. If staining is more chronic we recommend using the Eye Cleaning Solution to fully wet the hair and then remove the softened stain/debris with a wipe. Does not contain any boric acid, peroxide, bleach, or antibiotics - Safe and gentle around the eye. Warning: For topical animal use only. There are currently no questions for Optixcare Eye Cleaning Wipes - be the first to ask one!